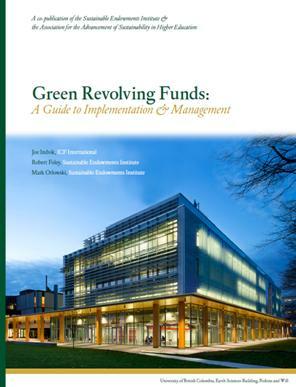 Green Revolving Funds: A Guide to Implementation & Management combines the expertise of energy professionals and college administrators from dozens of institutions to establish best practices for designing and managing green revolving funds (GRFs). The resource is a co-publication of the Sustainable Endowments Institute (SEI) and the Association for the Advancement of Sustainability in Higher Education (AASHE), and was developed with the consulting firm ICF International. The full version of the guide provides both a broad overview of the green revolving fund model as well as expanded technical guidance on measuring project savings, conducting accounting procedures, and evaluating fund analytics. More case studies and solutions to common obstacles provide a higher level of detail for administrators looking to design and implement a GRF. Additionally, the guide still includes sections on the components of a GRF, the process of designing a fund, and information about joining the Billion Dollar Green Challenge. Description: Greening the Bottom Line 2012 continues research into the rapid growth of green revolving funds (GRFs), a sustainability financing mechanism that colleges, universities, and nonprofits have increasingly adopted as a means to fund sustainability initiatives inside their buildings and operations. These initiatives typically reduce energy and resource use which result in decreased operating costs and an improved environmental impact. Though many of these GRFs are young- there have been 36 new funds created since 2010- their portfolios have already begun to post impressive returns, with a median reported return on investment of 28 percent. Implementing efficiency measures can benefit not only the institution itself, but also the students, faculty, staff, and community members that call the campus their home. Greening the Bottom Line 2012 found that a growing number of schools are seeking to implement efficiency projects by reaching into the campus community for inspiration, research, and volunteers. Greening the Bottom Line 2012 also reports on the project- and fund-specific energy savings, cost savings, and fund structures of GRFs across North America. Reported return on investment between 20 percent (Georgia Institute of Technology and the University of North Carolina at Chapel Hill) and 57 percent (Boston University). Publication Partners: American College and University Presidents’ Climate Commitment (ACUPCC), Association for the Advancement of Sustainability in Higher Education (AASHE), Center for Green Schools at U.S. Green Building Council, Clean Air-Cool Planet, Clinton Climate Initiative, Focus the Nation, National Wildlife Federation Campus Ecology Program, New England Board of Higher Education, Rockefeller Philanthropy Advisors, Rocky Mountain Institute, Second Nature, UNCF Building Green Initiative, U.S. EPA’s Green Power Partnership, and Vermont Energy Investment Corporation. Funded By: David Rockefeller Fund, John Merck Fund, Kresge Foundation, Merck Family Fund, Rockefeller Brothers Fund and Wallace Global Fund. Description: Greening the Bottom Line 2011, published by the Sustainable Endowments Institute (SEI) with more than a dozen partner organizations, brings to light current trends based on the first survey ever conducted about green revolving funds (GRFs) in higher education. Green revolving funds invest in enhancing energy efficiency and decreasing resource use, thereby reducing operating expenses and greenhouse gas emissions. The cost savings boost the bottom line and replenish the GRF for investment in the next round of green upgrades. To better understand the emerging trend toward the creation of more GRFs, SEI conducted a survey in 2010 of colleges and universities using green revolving funds. Greening the Bottom Line 2011 examines and evaluates the results of this survey of 52 institutions. In recent years, energy- and resource-reduction projects have compelled student leaders to create sustainability projects on campuses across the country. Students can be involved in many levels of project management, including identification, approval, and management. This paper examines the role that students play in green revolving funds. After speaking with numerous students on a variety of campuses, it is clear that they are more likely to be engaged in the GRF when it allows them to engage with campus allies and raise awareness of environmental issues. Active support from faculty, staff, and other campus organizations can help students pursue goals both strategically and collaboratively. Three case studies—St. John’s University (MN), Whitman College (WA), and the University of Montana at Missoula— illustrate a number of effective uses of the green revolving fund model and successful strategies employed by these students. Sustainable food and dining is a popular topic on college and university campuses. Popular areas of focus include equipment upgrades in the kitchen, installation of campus or community gardens, and streamlining existing campus recycling operations, such as by converting campus vehicles to run on used vegetable oil from the dining hall. Research shows that these types of projects are ideal funding candidates inside the green revolving fund model as they coincide with the fund’s common goals of reducing resource use and engaging the community. Though these projects have remained largely untapped by financing through green revolving funds, this white paper examines both the successes and obstacles of financing food service and education programs through the green revolving fund model on eight campuses in the United States. Institutions with small endowments of $100 million or less have overcome resource-related barriers to creating green revolving funds (GRFs). By establishing a GRF, these schools have added value to their campus and gained a competitive advantage in the sustainability realm. An examination of 16 schools with small endowments revealed five recommendations for schools establishing a GRF: (1) shape your GRF to appeal to institutional strengths; (2) take advantage of available resources in creating and implementing your GRF; (3) specify project restrictions and guidelines for initiatives funded through the GRF; (4) create a GRF that supports your institution’s financial structure; and (5) align your GRF with institutional goals and engage stakeholders. Two schools in particular, Thompson Rivers University (British Columbia, Canada) and Grand Valley State University (Michigan) provide examples as two case studies on how they were able to work around limited resources to implement a successful GRF. These documents, freely available online, highlight a broad range of ways for the green revolving fund to conduct and track its operations, from project applications to fund proposals, charter, and bylaws. They represent just a sample of the many documents that schools use to organize and administer their funds. More documents are available for Billion Dollar Green Challenge participants. If you’re not part of The Challenge, visit Join The Challenge for information on how you can sign up your school. British Columbia Institute of Technology, Revolving Fund for Sustainability Initiatives Guidelines — Guidelines and operating procedures for BCIT’s fund, includes sections related to the fund’s history, administration, project approval process, and statement of use and loan fund principles. Carleton College, Sustainability Revolving Fund Charter — Charter document for Carleton’s GRF, includes sections related to the fund’s purpose, goals, financing, and governance. Harvard University, Green Loan Fund Full Cost Loan project proposal — Shows fields necessary to place a request for funding to Harvard’s Green Loan Fund, includes sections on the project’s administration, description, and funding and accounting procedures. Miami University Ohio, Revolving Green Fund Packet — Packet of information related to Miami’s fund, including the fund’s charter and a project application cover sheet. The charter section includes information on the fund’s goals, management and procedures, and criteria for project assessment. University of Illinois at Urbana-Champaign, Revolving Loan Fund Agreement — Similar to a charter, this document outlines the financial and administrative agreements which support the University’s revolving loan fund, between the Office of the Chancellor, Student Sustainability Committee, the Office of the President, and Facilities & Services.